ONLY 2 MORE DAY UNTIL MY BIRTHDAY!!!!! I'm not excited at all. And I haven't been birthday shopping on Etsy either. I just decided to make up a list of things that I really, really like. And I just happened to make this list today. Just a coincidence, OK? First off, as soon as I get my birthday money, I am buying this ice garden sweater jacket from Ahpeele. I am seriously in love with the cool design. And normally I like hoodies, but I think the collar on this sweater is a nice change. It's a perfect jacket for work when the A/C is blasting, or for wearing skimpy shirts when the weather is too cold for them. I love it! Next on my clothing wishlist is a gorgeous shirt that I've been eyeing for a long time. Actually, "drooling over" is more accurate. If only I had that kind of money to spend on a shirt (I realize it's the same amount as the sweater above... but jackets are supposed to be more expensive than a t-shirt). But this really is no ordinary shirt! Made by VenniCaprice, the ruffled drawstring neckline is extremely flattering and unique. I also love the light silvery gray colour. I wonder if I could actually pull this shirt off...? That's the one downside of buying things online ~ you can't touch the fabric, or try things on to see if the fit is right. I would hope that clothes designers are OK with returns due to sizing. Anyway, this next t-shirt is an example of something that probably doesn't need to be tried on. A t-shirt is a t-shirt. And luckily, Deadworry has measurements in each of their listings so you can be sure the size you choose will fit you. Their bunny fufu shirt is my absolute favourite rabbit shirt on Etsy. 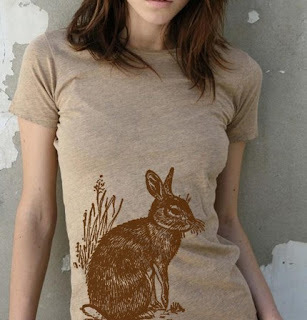 Knowing my rabbit obssession, it won't be long before this one resides in my wardrobe. Instead, this bunny mug rug is sure to bring a smile to my face every morning. Embellished with a sweet sprig of berries, it would be hard to actually sit a full mug of coffee on this coaster ~ I wouldn't want to get it dirty! 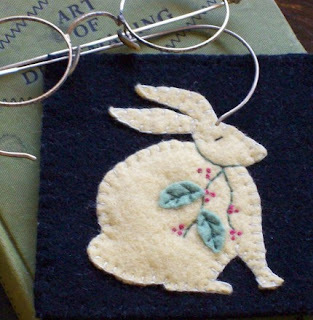 Handcrafted by NeedleWoodDesigns, this is another bunny I'm expecting to see around the house sometime soon. Now if only I could find some money to actually make all these purchases... Why can't I win the lottery? Why??? If I did win, this necklace would also be one of the first things I buy. And guess what? Yep, more buns ! 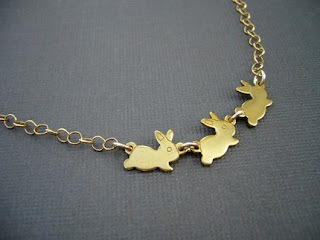 This one is crafted by cravejewelrydesigns, where I've seen other really sweet bunny charm necklaces. This little row of golden bunnies is absolutely adorable though! And I see they've sold already (since I found them last night). Lucky for me, they aren't one-of-a-kind. While I'm adding jewelry to my collection, I can never resist some great flowers. 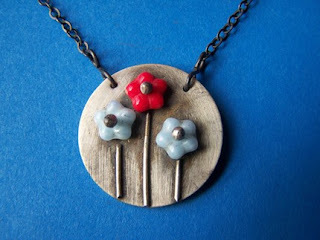 I have tons of flower jewelry, but I think I'll have to add this posey pendant (and maybe some matching earrings) soon. The unique design, by rubygirl, caught my eye quite some time ago. I love how the bead are held on to the metal disc! You can find this design in different colours, and it was hard to choose this one over the primary colours (bright blue, red and yellow blossoms). But recently, I've been really attached to the combination of red and turquoise. Either one (as well as the all red pendant) would look fabulous with the red posey earrings also sold by rubygirl. Another recent obssession of mine has been small, dainty earrings. I recently purchased some simple amoeba ones from colleenbaran and I wear them all the time. 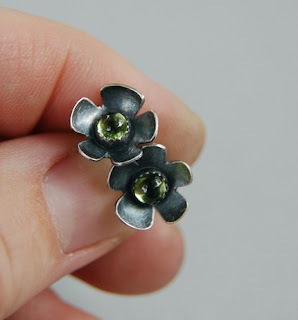 I really like these mistletoe ones by wildflowerdesigns not only because they're flowers, but also because the centre is peridot, my birthstone. When I was a kid, I hated the August birthstone. I thought the green was such an ugly colour (as my aunt thinks, who's birthday is Aug 10). But as I've grown up, I've come to like the soft, light green that is peridot. It's very easy to wear. As I imagine these earrings would be. Wait, if my birthday is in August, and it's August right now... well! My birthday must be really soon! How soon? 2 days!!! That's how soon!!! Nope, not excited at all. Well, if you've been paying any attention to my blog, you'll also know that bunnies are not my only obssession (long standing, not the fleeting ones like colour combinations and favourite pieces of jewelry). The one I'm talking about is small dishes. I know, I have a problem. It's just that cute little plates and bowls really do it for me. So the last item on this list (I promise it's the last one... 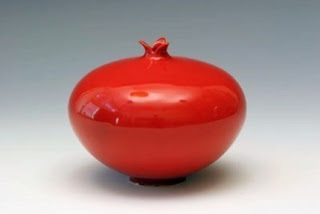 I could go on for much longer, but I'll resist) is this dainty little pomegranate vase is by whitneysmith. Whitney has a shop full of adorable china, but this eye-catching vase is definitely my favourite. OK, I'd also kill for her lichen plates and nesting lotus bowls, but that's beside the point. Although I think this would be even cuter as a little bowl with a lid. Now, the whole point of this list is so that you can buy me things. Don't you dare go and purchase any of these things for yourself! I've already lost 2 things from my first list (I was devastated to find 2 of the cute little bowls I listed gone.... they better be shipping to my place!!!! ), I don't want to lose all of these too!